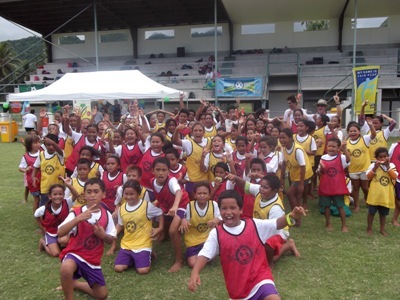 On arrival all children received a special Pacific Nations Celebration T-Shirt, before mixing in with students from the various schools attending and taking to the field for some Fun activities and small sided games. Facilitators participating in the current programme did a fantastic job delivering the activities to the enthusiastic children and had just as much fun as they did. Public Health who have been very supportive of this programme were on hand to see the children being very active before enjoying their 5+ a day with all the fruits and also hydrating themselves with water sponsored by Pacific Spring. The Children were also treated to Slap bands sporting BE ACTIVE. Red Cross was also kept busy during the activities with a few minor injuries. The celebration was very successful and we would like to say Thank You to Pacific Spring, Turtles, Public Health and Red Cross as well as acknowledging the continued support and funding from the Australian Government (AusAid) and Oceania Football Confederation (OFC).